The United States Colonial Marines. Ultimate trouble-shooters equipped with state-of-the art firepower, capable of power projection across the vast expanse of deep space. They can sharpshoot a man at a thousand meters or obliterate an entire world from the safety of orbit. They reckon they are unbeatable. But on a dirtball colony known only as LV-426 the unthinkable happened. The Aliens™ Colonial Marines Technical Manual is your official guide to the equipment and organisation of the United States Colonial Marine Corps. Packed with never-before-published diagrams, technical schematics and plans, the manual takes a detailed look at the guns, vehicles and ships of the USCMC, and the men and women who use them. A must for all Aliens™ fans, this book examines the technology of the film’s futuristic nightmare in every detail, and tries to discover exactly what went wrong on LV-426. The manual is divided into two sections, the first of which discusses the equipment and armaments used by the Colonial Marines, often accompanied by quotes from various Marine Corps personnel. The manual describes the equipment of the Colonial Marines in great detail, and contains expansive descriptions of the M41A Pulse Rifle, the UD-4L Cheyenne Dropship and the Conestoga-class transport starship (such as the USS Sulaco). While staying faithful to the film, the manual also expands upon a number of topics not depicted on screen, including the heavy weaponry, artillery and armor support available to the USCM. The first section also includes a brief history of human, colonial and military developments of the 22nd century, which subsequently serves as one of the most in-depth sources of background information on the Alien universe and its history up to the point of the film series. The manual contains details of the organisational structure of the Colonial Marines, again staying faithful to the films whilst adding and expanding information. The second section of the manual consists of a series of message transcripts between Weyland-Yutani Corporation personnel regarding the events of Alien and Aliens, interspersed with technical information on some of the non-military equipment seen in those films, including the USCSS Nostromo and the Caterpillar P-5000 Work Loader. In particular, the Weyland-Yutani transcripts discuss theories on Xenomorph biology and how the species may be exploited for monetary and military gain. Presented in chronological order, these transcripts end with a Weyland-Yutani team rediscovering the derelict ship on LV-426, with the final entry being a communiqué from a science team preparing to enter the vessel to investigate. 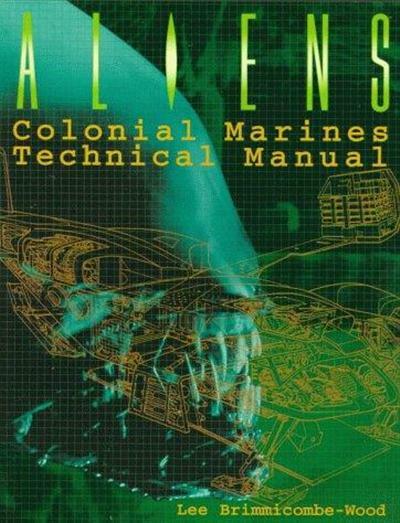 The Colonial Marines Technical Manual has its origins in the pages of the “Technical Readout” section of Aliens magazine, produced in the United Kingdom by Dark Horse International in the early 1990s. The Technical Readout was written and illustrated by Lee Brimmicombe-Wood, while his business partner and future editor of the manual, Dave Hughes, was the principle contributor of other articles and reviews for the magazine. 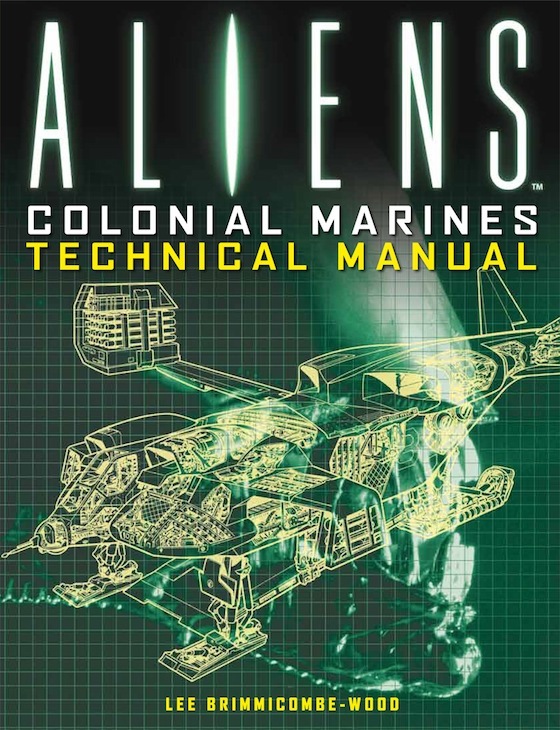 A significant amount of the Colonial Marines Technical Manual was copied directly from the Technical Readouts, with minor alterations such as changed names. A large amount of new material was also created for the book. Numerous photos and illustrations for the manual were produced with use of actual movie props from the film’s armorers, from the personal collection of Harry Harris, and from the licensed Alien War attraction operating in London at the time. For the photographic images included in the manual, the props were modelled by one of the actors who portrayed a Marine at the Alien War attraction. Other material was provided by 20th Century Fox, including illustrations by Aliens production designer Syd Mead. The publisher of the book, Boxtree Ltd., only possessed the rights to material based on the second film in the franchise, but as Aliens refers heavily to the first film (and because 20th Century Fox was so impressed with Brimmicombe-Wood’s work) the studio allowed information regarding the plot and vehicles of Alien to be included as well. However, material prepared for the book based on Alien3 had to be removed, the only remnant being an oblique reference to the damaged Bishop’s remains being recovered following the events of the third film. When Titan Books published a revised edition of the Colonial Marines Technical Manual in 2012, a piece on the escape pod seen at the start of Alien3 was reinstated, presumably because Titan owns the rights to produce merchandise based on all of the films in the franchise. The Colonial Marines Technical Manual notably contradicts dialogue in Alien Resurrection that states Ellen Ripley’s actions in Aliens and Alien3 effectively wiped out the Xenomorph species (at least to mankind’s knowledge); the book briefly states that the derelict on LV-426 survived the explosion at the end of Aliens, and that it is subsequently rediscovered by Weyland-Yutani. This plot point would later be followed up in the video game Aliens: Colonial Marines. The word unnamed is misspelt “unamed” many times throughout both the original and reprint versions of the book. The planet Thedus is spelt “Thetis” in the Weyland-Yutani transcription log. Alien: The Weyland-Yutani Report — A similar technical guide about the species Xenomorph XX121. The Book of Alien: Augmented Reality Survival Manual — A similar technical guide about combating the Xenomorph.